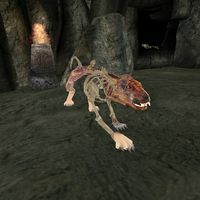 Solstheim boasts two unique types of undead creature: the Bonewolf and the Draugr. In addition there are several new types of Skeleton, including the especially-powerful greater skeleton champion. 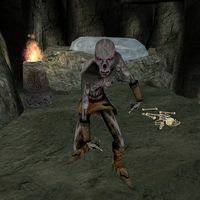 Description: An undead type of wolf haunting the resting places of the old graves on Solstheim. Found: Often found in Barrows. Description: This undead† type of northern barbarian haunts the resting places of the old graves on Solstheim. Their mad search for flesh makes them fierce fighters, resisting many kinds of attack. †Draugr are not actually considered undead by the game and are instead set as creatures. As such, Turn Undead spells will not work against them. Skeletons already existed in Morrowind but several new types have been added. The Greater Skeleton Champions (in all tombs all over Solstheim) begin appearing only once the player has reached level 40 and has taken the Bloodskal sword from Bloodskal Barrow (exception: the Greater Skeleton Champions in Bloodskal Barrow appear before level 40). This page was last modified on 5 March 2019, at 09:33.